The National Diabetes Services Scheme (NDSS) supports people with diabetes by providing discounted medical supplies and equipment, expert advice, and group support. The NDSS is free to anyone with a Medicare card and covers all kinds of diabetes. The Scheme is funded by the Australia Government and administered by Diabetes Australia, which has branches in each state and territory. This support aims to help people with diabetes on their journey to self-managing their condition. Diabetes Australia research showed that lower numbers of people from culturally and linguistically diverse (CALD) backgrounds and from Aboriginal and Torres Strait Islander (ATSI) communities had registered to receive the NDSS card. The card provides access to discounted diabetes products and support services across Australia and is typically recommended by doctors when a patient is first diagnosed, or by diabetes educators in their education sessions. Fenton conducted individual interviews and focus groups with health professionals and people with diabetes from five major language groups and with health professionals and people with diabetes from ATSI communities. Combining qualitative insights with data from the NDSS registration database, we created strategies to drive two national campaigns: one for CALD and one for ATSI communities. Both strategies sought to achieve the same objective, but were tailored to account for the different needs of health professionals and people with diabetes from CALD and ATSI communities. The strategy sought to increase registrations by creating a positive awareness loop: increase awareness of the NDSS among health professionals and remind them of their vital role in recommending it to patients; increase awareness of the NDSS card among people with diabetes; and remind them to ask about signing up at their health centre or online. Both campaigns hinge on the promotion of evidence-based information resources about living well with diabetes that were focus tested to be culturally appropriate, and available in translated form. The tailored resources produced by Fenton addressed two gaps highlighted in formative research: 1. Heath professionals often felt ill-informed to recommend the NDSS, and people with diabetes – if they had heard of the Scheme – often assumed it was not intended for them; 2. Literacy and language are major barriers to people with diabetes understanding their condition and learning how to manage it effectively. 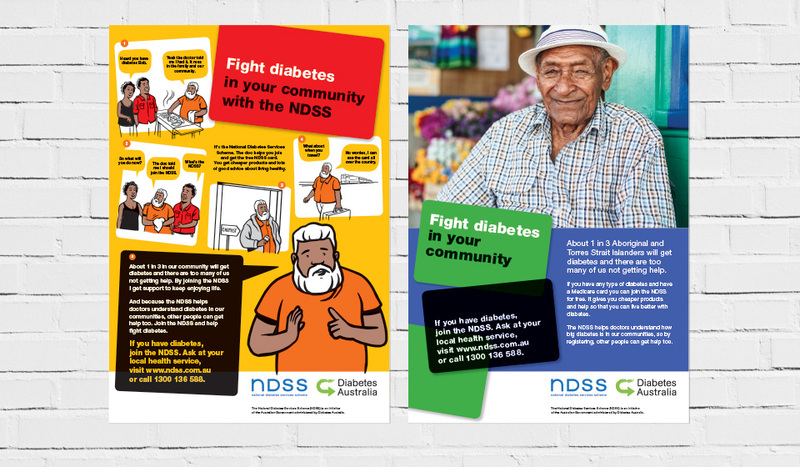 We designed, scripted and produced community service announcements (TVC and radio) to promote the NDSS benefits, clarify eligibility and call on health professionals and people with diabetes to use the Scheme. 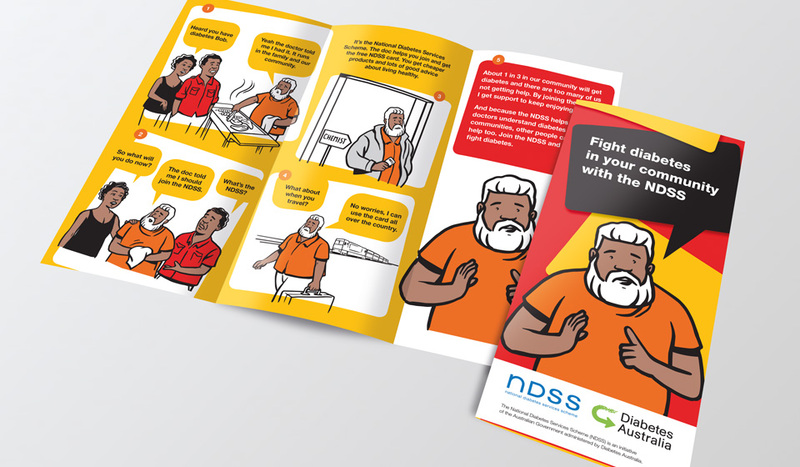 Following the first burst of advertising, we created electronic stakeholder action kits for reaching out to health professionals and community organisations that support people from CALD or ATSI communities. These action kits packaged the diabetes-information resources and promotional material with a range of content that could be reproduced or adapted across different print and online media in an appeal to help spread the main campaign message: everyone with diabetes should be able to get the free support available through the NDSS. 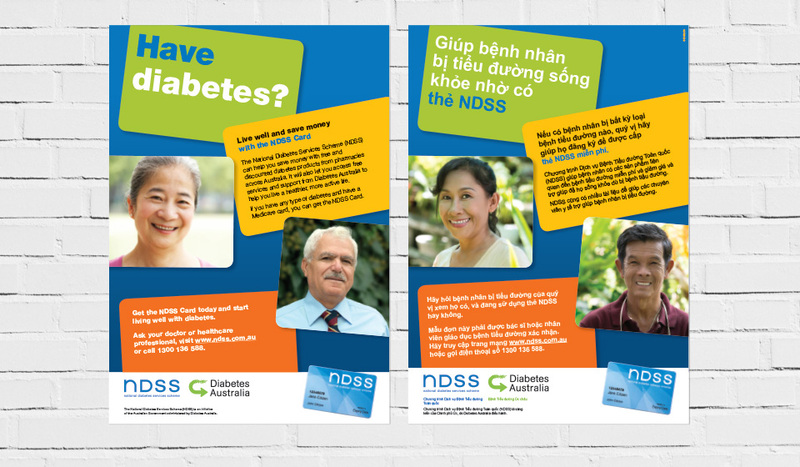 A second advertising burst build on the initial awareness of the NDSS with online search and display advertising targeting health professional and consumer health websites to drive traffic to the NDSS multicultural portal, which holds a library of free diabetes-specific resources in over 24 languages. A survey of stakeholders is currently underway to test awareness and recall of the campaign, and to gauge uptake of campaign resources. NDSS registration figures will inform the next phase of the campaign strategy.